Phnom Penh is a rather hectic city, and after Saigon I wasn’t particularly in the moods for the constant shouts of the Tuk Tuk mafia. It’s one of those places where I just felt a bit on edge whenever walking around the streets, I think it would be hard to relax there….unless your idea of relaxing is getting drunk in one of its many bars of course. 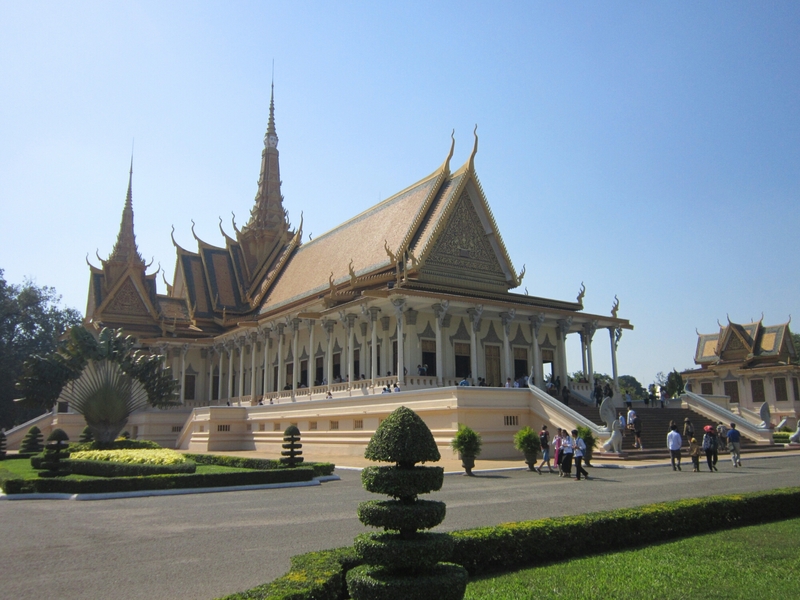 On our first day there me, Dylan and Amanda went to the Royal Palace. As the royal flag was flying it meant the King was in residence that day (so we overheard a tour guide telling his group anyhow). The palace is very pretty, it reminded me a lot of the grand palace in Bangkok. After that we had a little walk around to see the Independence square and then headed back to our hostel – 19 Happy House. It’s a good hostel as far as Phnom Penh goes, and it’s owner Alex is a great guy. Second day was really emotionally tough as we went to visit the S21 Prison (Toul Sleng Genocide Museum) and the Choeung Ek Killing Fields. Between 1975 and 1979 the Khmer Rouge, led by Pol Pot, were responsible for the deaths of 3 million people. The total population was 8 million. The Khmer Rouge committed horrendous acts of murder and torture and forced entire populations out of cities into the countryside to work as farmers, forcing unachievable targets for rice production on people who had no clue how to be farmers. In 1979 they were removed from power by a combined force of 120,000 Vietnamese troops and Cambodian troops who had turned against them. They fled to the west and civil war continued for years. Pol Pot died in 1998, never having faced trial for his crimes. We took the audio guides for both throughout the S21 prison and the Killing Fields. S21 prison was a former school in Phnom Penh that the Khmer Rouge used to torture and kill people, for reasons as simple as that they wore glasses meaning they were an intellectual and therefore an ‘enemy’ of the Khmer Rouges revolution. They used to force people to confess to being a ‘spy’ and name others who were part of ‘CIA – KGB’ spy rings. The Khmer Rouge documented all their victims, in only the way a sick twisted autocratic regime could. In the S21 you can still see bloodstains on the walls and instruments used to torture people. There are many photos of both the victims and those who committed the atrocities. There is a room which contains many skulls from the victims. 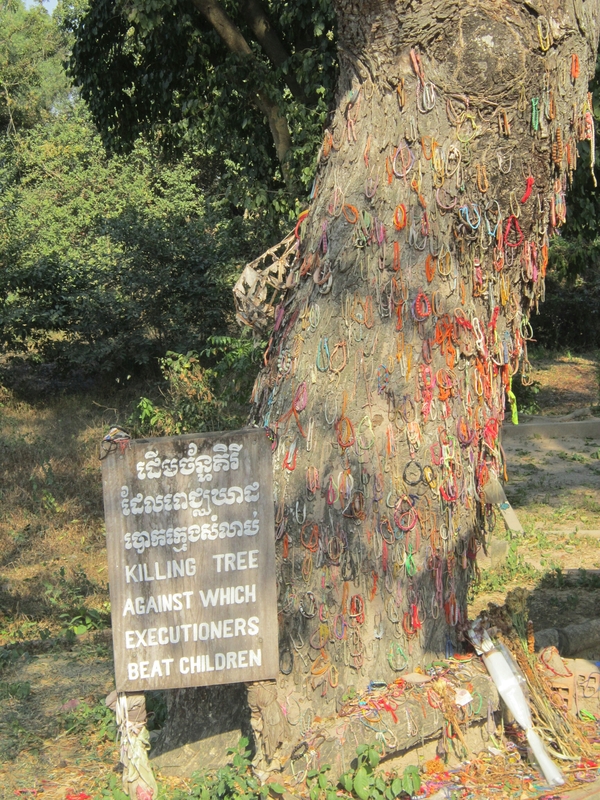 The Killing Fields are outside of Phnom Penh, at Cheong Ek. 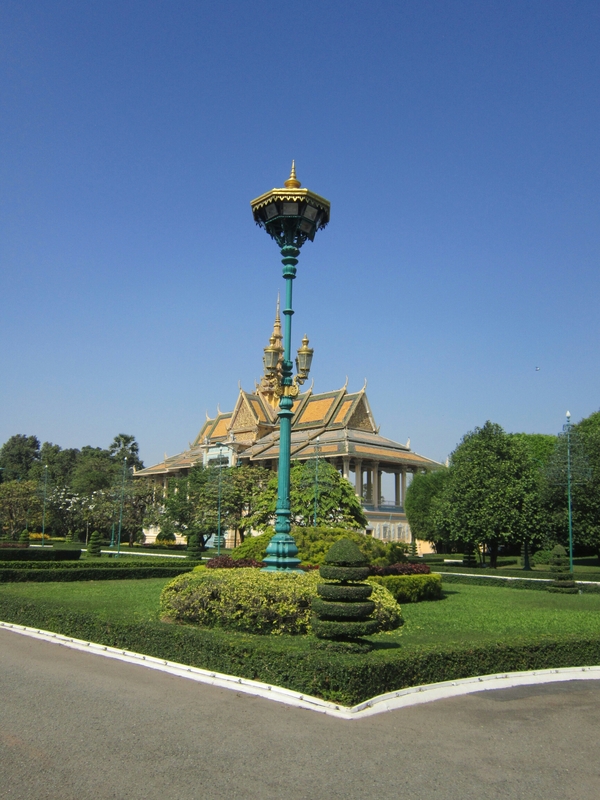 They are where the Khmer Rouge took victims, including many from the S21 prison, to kill them. At the Killing Fields you see mass graves, where bone and clothing rags can still be seen in the ground, and learn details of the murders, such as how the Khmer Rouge played loud music to conceal the screams of the dying from local villagers and how the used the sharp edges of tree’s to slit peoples necks. One of the hardest to see is the Killing Tree. The Khmer Rouge believed if they killed a child’s parents they must also kill the child too, to stop the child seeking revenge in later life. They literally smashed children’s heads against this tree to kill them and throw them into a mass grave. At the site there is also a monument that has been built to victims, containing many skulls that have been excavated. It was a very harrowing experience learning about the atrocities committed. Something I think people must all be aware of so we can stop it happening in the future.